Greentech and Syntivia have recently joined forces in a co-authored study that uses the biological mechanisms implicated in the skin’s response to atmospheric pollution. The study highlights the biological activity of Greentech’s new anti-pollution product. 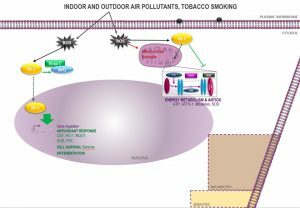 The aim of the study was to evaluate the potential anti-pollutant effect of an active extract of Shisandra Chinensis on cell damage caused by Urban Dust. 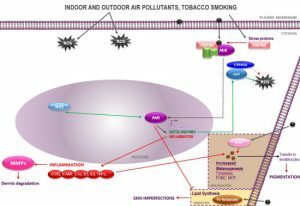 The study takes into account the main pathways that are implicated in the skin’s biological response to pollution stress after exposing cells to urban particulate matter (Urban Dust NIST® SRM®). Method: After cytotoxicity evaluation to determine cell viability, Normal Human Epidermal Keratinocytes (NHEK) cells were treated with the Shisandra Chinensis extract for 24 hours and then exposed to urban dust for 6h . The expression of AhR, Nrf2, DJ1, and NF-kB was detected and quantified by immunofluorescence. 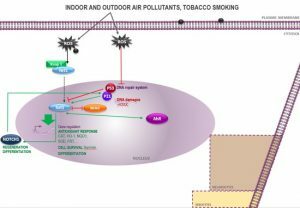 NRF2 (A), AhR (B), NF-kB (C) and DJ1 (D) cytoplasm expression after urban dust exposure or co-treatment with urban dust and Shisandra Chinensis extract. We noted that the co-treatment significantly inhibits NF-kB and AhR expression while showing a significant activation of Nrf2 and DJ-1. Method: 3D reconstructed full-thickness models were treated with Shisandra Chinensis extract 6 days and then exposed to urban dust for 1 day. The activation of the main inflammation mediator IL6 and PGE2 was quantified by immunoassay. The analysis of malondialdehyde (MDA) was conducted using immunohistochemistry. Secretion of PGE2 and Il-6 in polluted or not polluted reconstructed skin supernatant treated or not with Schisandra chinensis extract. Analysis has been done 24h after pollutant stress. After 24 hours of urban dust treatment (increase of PGE2 and IL-6) in the reconstructed skin supernatant, inflammation disappeared following the addition of the Shisandra Chinensis extract. 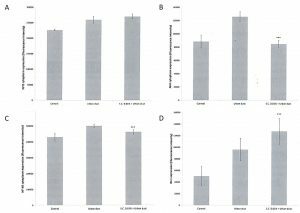 MDA expression in epidermis of skin equivalent model treated or not with Schisandra chinensis extract. Analysis has been done 24h after pollutant stress. Expression of MDA in reconstructed skin was also significantly reduced. The Shisandra Chinensis extract shows a protective effect by increasing the level of DJ-1 protein and Nrf2 expression and by decreasing the expression of AhR and NF-kB in the cytoplasm of cells that are exposed to pollution stress. Activation of Nrf2 could regulate and induce the expression of numerous detoxifying and antioxidant genes. Moreover, the increase in DJ-1 is a very interesting result since DJ-1 quenches the activity of Reactice Oxigen Species (ROS) and protects mitochondrial function. 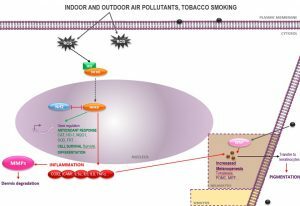 In addition, the inhibition of NF-kB and AhR pathways may prevent cellular deleterious effects. 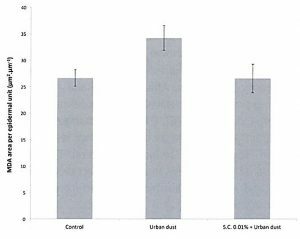 The study allows to conclude that Greentech’s Shisandra Chinensis extract protects cells from irritation and oxidative stress induced by environmental pollutants, as demonstrated on a skin equivalent model that was under Urban Dust-induced stress. (IL6, PGE2 / MDA). The Shisandra Chinensis extract provides overall skin protection. SOFW Journal recently published Greentech’s article on the effects of this new cosmetic active ingredient from Shisandra Chinensis extract to fight pollution stress. The article was published in SOFW’s March edition under the title « Stimulating NRF2 and inhibiting NF-kB to help skin combating pollution ». For more information on this project, please don’t hesitate to contact the Greentech and Syntivia teams.